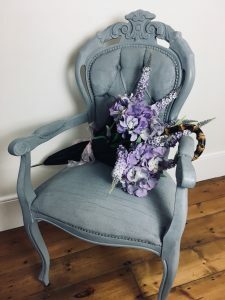 This is my post on DIY spring decorations. If you can’t view the video please click here. 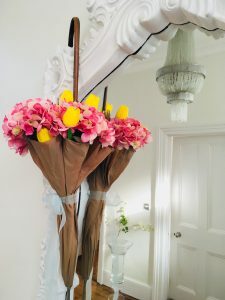 DIY spring decorations or how to upcycle an umbrella! This winter has gone on so long I’m completely over it and totally ready to embrace spring with every part of my being. So this week I thought I’d make a spring decoration for the home. As I know you are all busy I’m going to make it quick and simple. 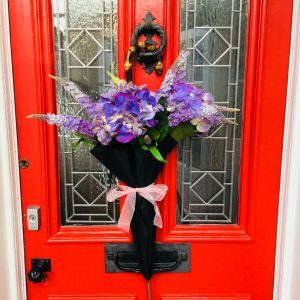 What is the one thing we are guaranteed in spring in the UK? So we tend to notice all these umbrellas strewn across the pavement by frustrated pedestrians on wet and windy days. 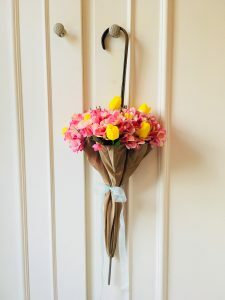 What better idea than to upcycle an umbrella to make the perfect spring decoration?! For the video, I placed the umbrella on a table, but it’s actually easier if you stand the tip of the umbrella on the floor and fan the spokes open slightly, but not completely. Place plant stems in between the spokes so the flowers are pushing out the fabric of the umbrella. For shorter stems this might be easier on the table. 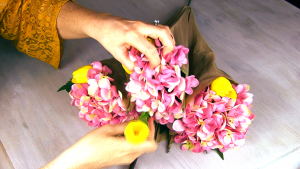 If it’s an automatic umbrella this is marginally harder so you may need to tape the flowers so they stay in place when you close it up. Use contrasting colours for maximum effect. Tie together with a bow half way down the umbrella to keep it perfectly in place. Hang for all to admire! 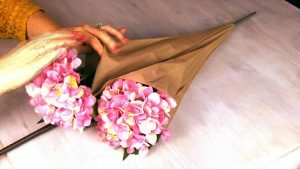 Faux flowers will obviously be easier to use, but if you do opt for real ones you could always pop in some oasis. Even better, recycle an upside down plastic bottle with the bottom cut off to hold water. This looks gorgeous just about anywhere. 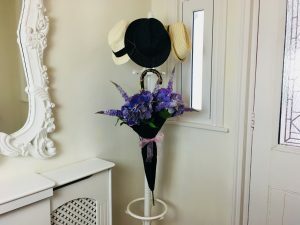 I tried it on the wall, hanging from the stairs, a hat stand and even the front door. So next time you go to throw down your broken umbrella in anger you know what to do with it. Let’s face it, because it rains all year round in this country it’s actually an appropriate decoration whatever the season! Make sure you send me a photo of your efforts – I’d love to see! Something I’m planning to do for Easter is make some crackers – yep I really do have them at all times of year! Check out my guide. 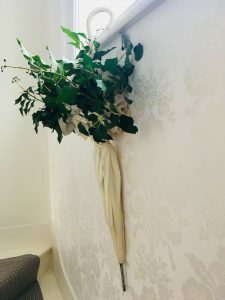 Something else you could do for spring is adapt my autumn decorations guide to cater for the current blossoming greenery. Thanks Katherine – so pleased you like it!